Paul Crewe: Do you play football? Caretaker: I was so bad at sports that when I was in school they would usually pick me after the white kids. 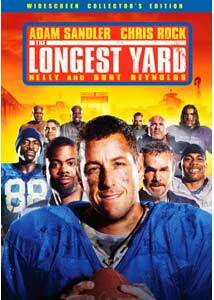 Apparently the producers of this remake 1974's The Longest Yard didn't get the memo that redos are almost expected to be worse than the original. Instead, they have fashioned an entertaining remake that, while predictable and slightly toned down (the original carried an R-rating), easily proves to be the better of the two, despite a few slight hiccups along the way. Adam Sandler takes on the role of Paul Crewe, a disgraced former NFL quarterback who was banned from the game thanks to a point-shaving scandal. Without any celebrity endorsements left, Crewe spends his time sponging off his wealthy girlfriend (Cox) and drinking a lot of beer. Eventually, Crewe takes a ride complete with a six-pack, causes a major traffic accident, and is shuttled off to prison for violating his parole. As luck would have it, he has landed in one particular Texas penitentiary thanks to Warden Hazen (Cromwell), a football fan who wants to see his team of guards win the state championship with the help of Crewe's mentoring. Crewe makes the suggestion that the guards schedule a weak opponent to tune up on before their first real game, and the Warden suggests Crewe field a team of inmates and a game is set. With the help of Caretaker (Rock) and former Heisman trophy winner Nate Scarborough (Reynolds), he pieces together a team of convicts to go head to head with the guards. There are no great cinematic moments to be experienced in Peter Segal's The Longest Yard, but credit goes to him for crafting a film that offers up an abundance of energy and entertainment that never feeling rushed. While the script is almost an exact copy of its predecessor—with a few conceits—Segal finds a nice balance between the roughness of the original film and the Adam Sandler formula, in which mildly offensive jokes and people get hit in the crotch equal laughs. To be fair, the only problem with The Longest Yard is that it can't sustain interest for an extended period of time. During the middle act in which the team is constructed and the inmates practice, there are too many montages set to popular music, and there are a few scenes where the dialogue feels stilted and forced, even for an Adam Sandler vehicle. However, by the time the game rolls around, Segal brings the film back up to speed with a thrilling and well constructed finale that manages to instill the tiniest doubt, even with the certain payoff looming. With a remake where each step is going to be known from start to finish, it is important that the casting work in the case of the Longest Yard is does perfectly. Sandler brings his usual sardonic one-liners to the table and this time there seems to more behind them. It is hard to buy Sandler in the role at first, but eventually the actor's performance wins you over. Strong work is also offered by a host of actors including Rock, Tracy Morgan, Burt Reynolds, as well as rap star Nelly and a host of former NFL players and assorted wrestling stars. Image Transfer Review: The 2.35:1 anamorphic widescreen transfer for The Longest Yard is disappointing from the outset as the image appears to be overly dark. The opening scenes take place at night, so they're passable, but when the action shifts to the plains of Texas things are still shaded when they should be crisp and vast. The earth tones that dominate the film have nice depth and detail, but too often seem muted, and there are a few slight instances of haloing. Audio Transfer Review: The Dolby Digital 5.1 mix is all that you might expect from a modern-day football film. The bass hits hard and the surround channels are filled with on-the-field ambiance. Dialogue is crisp and clear while the rap and rock soundtrack sounds crisp coming from all speakers. A fine mix. Extras Review: Billed as a "special collector's edition," this DVD fails to include one single extra feature that will likely excite any fan of the film. First, we have the standard making-of piece. Running just shy of 30 minutes, First Down and Twenty Five to Life chronicles the expansion of an already existing prison in an effort to make the location seem more imposing, as well as the troubles of filming the football scenes and the hard hands dealt by mother nature. Little insight to be gained here. We are also treated to looks at the diets of the athletes on the set in The Care and Feeding of a Pro Athlete, and to a look at how the football footage was captured in Lights, Camera, Touchdown. Nine deleted and extended scenes are offered, and unsurprisingly the excised footage was rightfully left on the cutting room floor. A music video for Nelly's Errtime and a three-minute montage of football hits set to the song Here Comes the Boom round out the extra features. A remake that bests the original by offering up its own style, the 2005 version of The Longest Yard is a pleasant surprise that I most certainly did not see coming. Sandler does a great job, supported by some solid performances and a script that wisely cribs from the original while offering up an added level of humor that works to its advantage. Recommended.